The brand new Naomi Home Brisbane Glider and Ottoman set is designed with a nursing mother in minding in mind, offering you a serene and relaxing experience as you rock your baby to sleep. The product also offers of a comfortable matching ottoman that comes with the glider so that you get to put your feet up while singing lullabies to the little one. The design of Naomi Home Brisbane glider and ottoman set provides convenient seating space enveloped by cosy padded arms. There are two side pockets on the padded arm cushions which is handy to store baby books, toys or other supplies that should be at arm’s reach. Constructed with a strudy frame, the gliding mechanism consists of metal bearings enclosed within to allow smooth operation of the glider. A seat support is provided, over which the cushion sits perfectly. 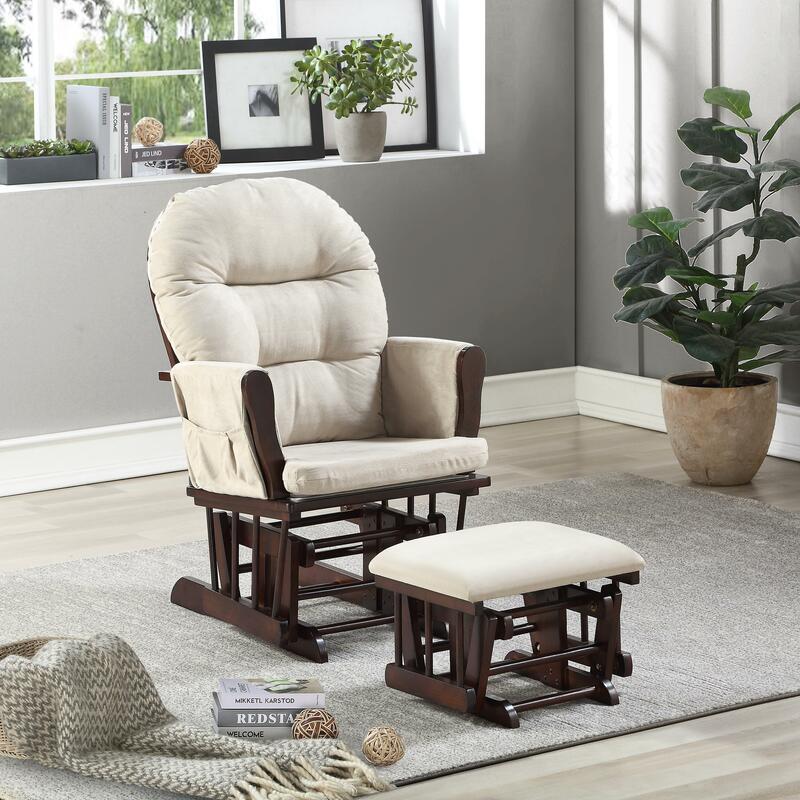 The attractive aesthetics of the Naomi Home Brisbane glider and ottoman can bring a unique charisma to your baby’s nursery. A perfect combo of dynamic furniture and cushions to match your home décor. It’s been a month now since I am using this Glider and Ottoman and I like the product. I think it’s a good one for the price they offer. No, It’s not an over-sized rocker but a perfect fit for people like me who want one on a budget and it does the job!!! This is really a great glider for the budget we were looking for. I am 5''1" and my husband is 5''11" and the glider accommodates both of us with ease. The padding is nice and I like the color too. Just like in picture. Overall a good product! Functions well for the price! I am happy with my purchase of this furniture set. Functions well, but it definitely has an overall feel consistent with the price. Smooth glide and great for feeding the baby. The side pockets are nice, and fortunately durable enough to withstand the attempts our 3-year-old has made to climb up using them as footholds. I received a set as a present by my sister in law. I was so happy with it, that I ended buying another set. Bought it for my wife a few months back and she feels relaxed in it. Color is good and soft textured. That ottoman is also fluffy with cushions. Liked the limely delivery too. I picked the grey and white design and it looks fantastic in my home. My wife feels so comfortable putting our 8 month old to sleep. 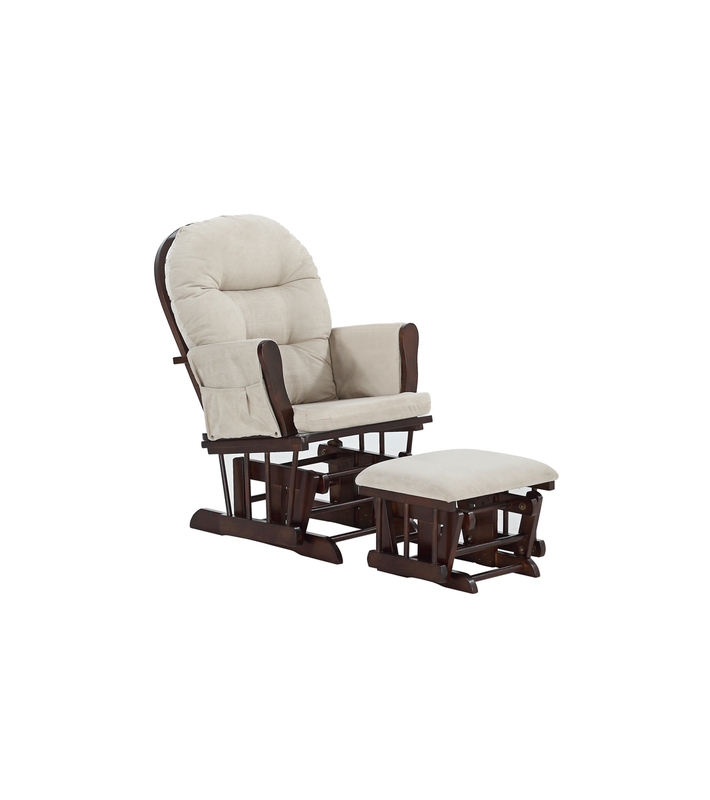 I was looking for a chair that I could kick back and relax with my baby in arms, my husband suggested this glider. It''s a great find and I am very thankful. This was the perfect chair for my daughter’s room. Nice size for small room and comfortable seat cushion. Could be a bit fuller. Assembly was pretty easy. I recommend it. Good price free shipping very satisfied customer thank you! It’s a beautiful chair with comfort cushion and a good wood finishing handles. I was pregnant when I purchased this and it is still comfortable to use this chair even after my delivery. I would recommend you to go with cream or chocolate. Would have given 5 stars but the back is a little bit short. Can''t rest your head on the back unless you scrunch down a bit. I guess if you''re holding a sleeping babe and your feet are up it would be easy to nap yourself. Seat is like memory foam! Absolutely PERFECT for our nursery. It''s comfortable and makes night feedings much easier. Half the time I end up falling asleep in it while nursing because it''s so comfy! Our baby loves being rocked, so this puts him to sleep quickly too. Perfect size mirror for my Bathroom! Good value, perfect size, not too large, item received undamaged. Over all I will give 5 stars. Great price and great Rocker. The price is great and rocker is perfect. It is a gift for my daughter who is expecting a child soon. I''m sure she will enjoy rocking her new baby. The rocker is very comfortable and the covers are easy to remove when she needs to clean them. I love this Rocker. Best glider for this price. This chair is very comfortable and I use it more than my wife who just gave birth to our baby. Its easy to assemble, just a few pieces that need to be screwed together. For the price, I think the product is extremely good quality. We purchased the cream and espresso color, perfectly matches with our nursery. I have rocked my baby to sleep here for last 2 months and we love it! Extremely comfortable and haven’t had any problems at all. It is very comfortable and it glides so smooth. Seat cushion is a little hard, but the chair works well. It is very comfortable and it glides so smooth. Pretty decent glider. I love the colour and we are very happy with the product. I was very surprised to have this delivered several days before the date they said it would arrive!! I am pleased with this glider, it is really comfortable and very easy to put together too. Very easy to assemble and sturdily built. I was hoping the material would be little softer as it feels more like outdoor chair but on the whole it is much better than what its pric may suggest.